The name itself, Buggerru, sounds unusual, and so is the location of this Sardinian coastal village which lies hidden deep behind the mountainous areas of the province of Carbonia-Iglesias, about 70 km northwest of Cagliari. One would think that such a place might have been quite isolated in the past but this was not the case since the rocks of this territory were highly rich in minerals. In fact in the 19th century, the heart of Buggerru’s cliffs was turned into a labyrinth of tunnels in the obsessive search to force out any precious materials that were available within the landscape. 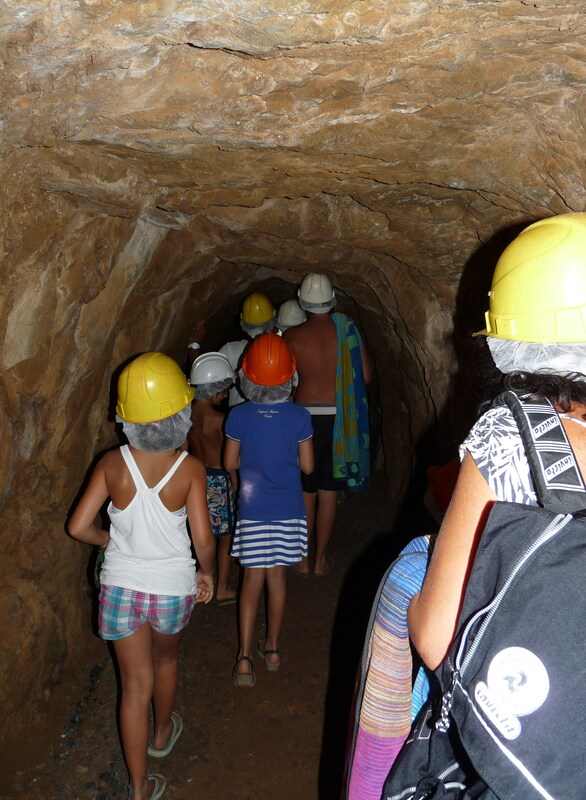 At first, both the locals and other Sardinians of the nearby villages thought that these mines were a godsend which would improve their standard of living. Indeed, their lives did change but for the worst, as life in Buggerru turned into an abusive and oppressive hell for many of the individuals working in this industry, even for women and children. Interestingly, Buggerru’s last mines closed down in 1980 and yet the locals have succeeded to sustain the mines’ economic potential by transforming some of them into tourist attractions, with the surviving miners acting as tourist guides of the site. A descending winding road surrounded by breathtaking mountainous scenery will lead you into the centre of Buggerru which in the last years has been flourishing as a significant port. The place is pretty small and at first hand it gives the impression of being mundane. However, once one reaches its mines and looks out at Buggerru’s huge cliffs which are splendidly surrounded with a bright azure sea, it will be immediately clear why this area has lately been used for a number of popular tv commercials. Surely, the present environment at Buggerru offers a remarkable spectacle to its visitors and this makes it difficult to realize that in the past, so many lives were shattered in this area. One of the most visited mines in this area is Galleria Henry. This tunnel is about one kilometre long and it was dug into the cliffs at fifty metres above sea-level. 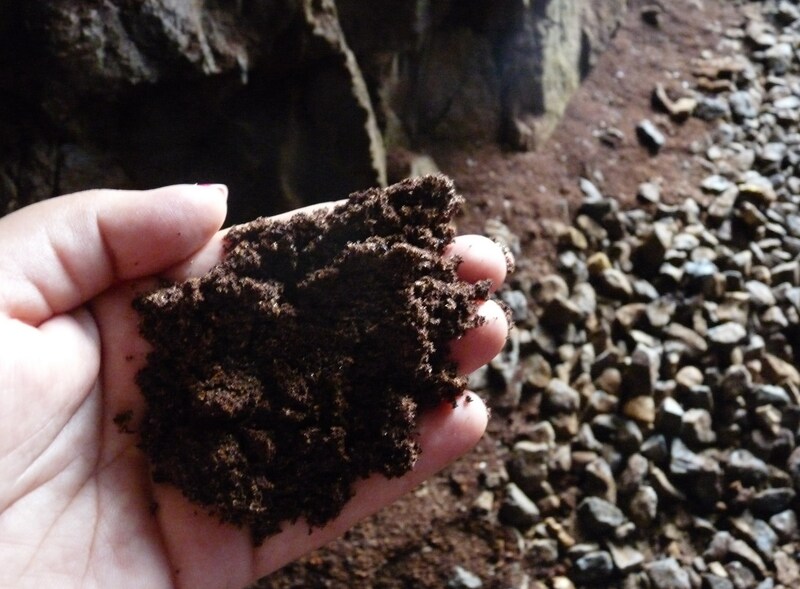 Galleria Henry was dug out in 1865 and it is particularly significant because it was created specifically in order to allow the introduction of a small train which could carry the excavated heavy minerals more efficiently. Prior to this mechanical invention, the transportation of this material was done by means of carriages which workers pushed along the way, either manually or with the help of mules. Tourists visiting this tunnel are led into its entrance wherein two ex-miners introduce them to the history of this place. With the aid of some old large photos which hang on the tunnel’s walls, the guides narrate quite vividly how life was in Buggerru, beginning from the day that this industry was created and ending right up to the period when these mines were closed down. In the 19th century, work conditions in these mines were miserable and contrary to other foreign workers who were assigned there, the Sardinian workers were shamefully underpaid and very ill-treated by the foreign owners of this business. In the process, even Buggerru’s landscape suffered from this cruel and selfish attitude as its forests were cut down in order to obtain wood to reinforce the tunnels’ walls, and later on to provide fuel for the train. September 1904 is a strong symbolic milestone in the location of Buggerru since during this period, a terrible incident took place in these mines and this resulted in significant and compelling changes that reverberated throughout the whole of Italy. It all happenned when the already austere regulations that were imposed on the workers were worsened even more as the mines’ directors ordered a further decrease in the workers’ interval of rest allowed during working hours. This was the last straw which the workers could tolerate and for the first time, they decided to join forces and to refuse to adhere to this new rule. In response, the directors requested the support of military soldiers and at one point, these fired at the protesting workers, killing three of them. As this horrifying news spread from village to village across Sardinia, the people retorted by uniting together in the first workers’ national strike which eventually led to the creation of the Italian tradeunionism. 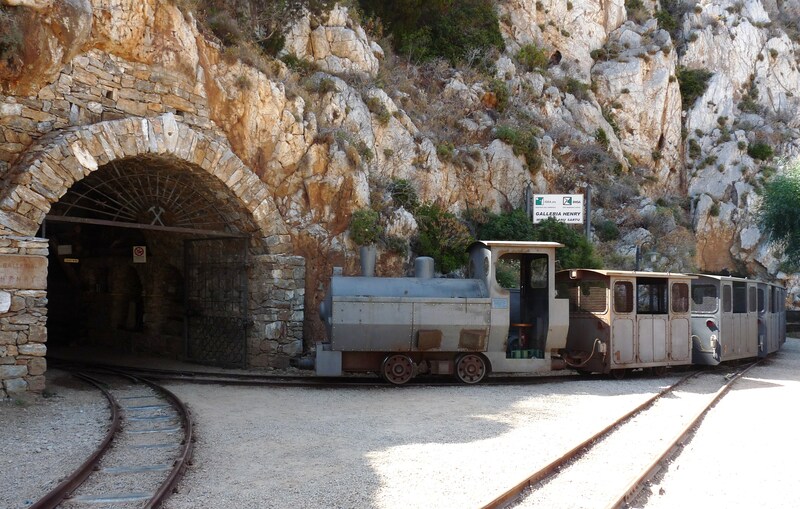 At the end of this staggering introduction, the visitors are invited to ride an old train that was used in these mines during the years when they were still operative. Even in summer, the tunnel is quite cold and ideally one should wear a jacket. The short trip along the dark tunnel is enjoyably unique as one can indulge in the opportunity to relive history for a brief moment. Children will surely find the train trip exciting as visitors are equipped with safety helmets and huge torches. The train stops in an open area where visitors can enjoy the magnificent views of Buggerru’s coastline and take some excellent photos. 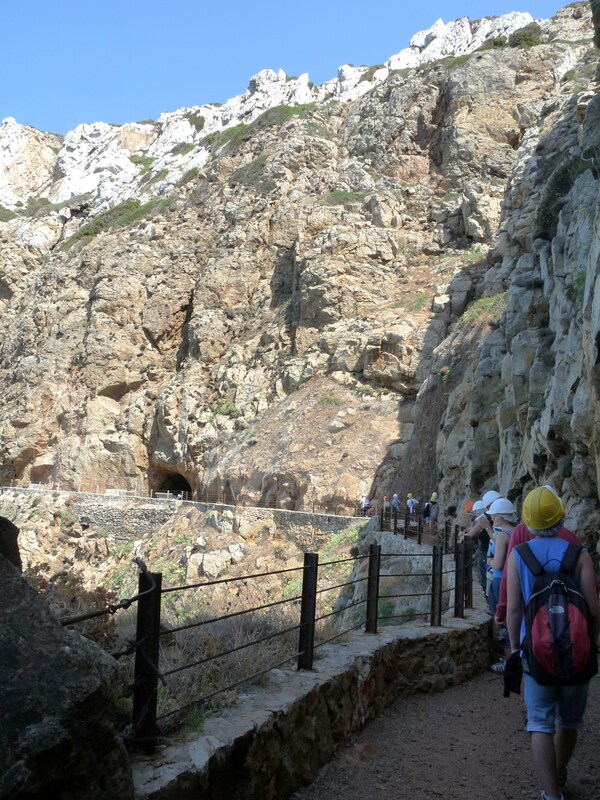 Then, the guides will lead the visitors back to the exit, though this time by walking through different tunnels which run impressively along the cliffs’ edges. Interestingly, it was this very landscape which terminated Buggerru’s mining industry, as the cliffs edges determined the limit of how much the mines could actually grow. Traces of copper lying on the walls and on the floors of these tunnels are still clearly evident and notwithstanding the beauty of the area, one can’t help remembering that these huge rocks that were dug out with great difficulty by the male workers, were then passed on to women, some of whom were even pregnant, in order to break them into smaller pieces, so that children could carry them in bags. Undoubtedly, very few visitors will remain untouched after getting to know about the history of this site and literally walking through it. Certainly Buggerru is the place for visitors who would like to explore a distinguished territory, coloured with adventure and enriched with the exclusive possibility of cherishing the locals’ historical collective memory right from its primary sources.